Psychiatric Tales is an autobiographic work that happens to explain mental illness in a succinct and novel way. It is already proving to be of use to both health professionals and mental health service clients. Published in the UK this year, it’s US release is scheduled for February 2011. From the early 1970s and the beginnings of the confessional genre within alternative comics there has been a tendency within comics for the author to showcase his or her neuroses: one only has to consider the works of Robert Crumb or Justin Green. Notably few comics, however, have tackled major illnesses like schizophrenia and organic brain disease or the physical sequelae of mental illness. Psychiatric Tales helps to redress the balance.The focus is on mental health services within the United Kingdom’s National Health Service, the author’s experience as a worker within that framework, and also the author’s own mental health problems. In addition, the book chronicles the causal relationship between the former and the latter relating the trauma and personal cost of working in the caring profession, a subject rarely discussed. The book is organized into chapters, although, this not being a textbook, there is no pretense at being a comprehensive survey. The first chapter, ‘Dementia Ward’, gives a peek into the day-to-day life of patients with organic brain disease and the people who are charged with caring for them. It catalogues the tragedy of dementia: the disintegration of both memory and personality; the regression into infantilism or the emergence of previously suppressed aggression. It is human nature to inject humor into hopeless or fearful situations, and Cunningham punctuates his grim stories with little jokes, such as his forgetting the keypad combination that allows access to the ward. It is apparent that, despite his self-professed gaucheness, Cunningham has an innate sense of comedy, timing and rhetoric. Successive chapters deal with self harm, schizophrenia, depression, anti-social personality disorder and so on. The chapter on schizophrenia stands out for its myth-busting power, dismantling the image of the dangerous psychotic axeman and replacing it with a more understanding portrait of the vulnerable, socially maladjusted victim. The cultural significance of mental illness is also examined in positive terms in the chapter entitled ‘People With Mental Illness Enrich Our Lives’, whilst ‘Suicide’ is a study of the damaging reverberations that follow the ultimate act of self-destruction: the pain, guilt and self-questioning of carers, family and friends. Cunningham confesses to being haunted for years by the death of one such patient, always wondering whether he could have done more to prevent the act. What makes this work so valuable is that Darryl Cunningham has viewed mental illness from both perspectives: as carer and as a client. He has suffered from severe anxiety and depression, and has considered suicide himself. This graphic enquiry into mental illness formed part of his recovery yet the work is without a hint of melodrama or self pity, delivered in the neutral tone of an observer. His view might be characterized as a compassionate form of bio-social medicine, and Cunningham is positive about his recommendation of treatment with conventional medicines, taking time to explain that drugs such as antidepressants work in a slow and subtle manner, often causing side effects before any improvement is seen. 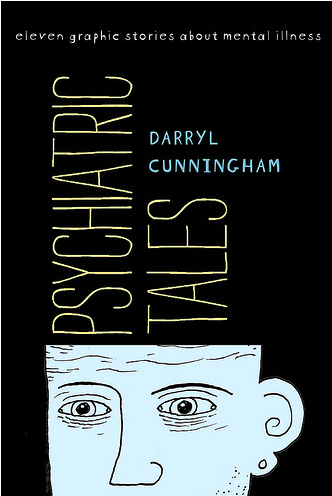 Darryl Cunningham is acutely aware of the discrimination and stigma that mental problems engender and Psychiatric Tales takes steps towards removing that stigma. He deserves the success he is beginning to find. This book will undoubtably touch many lives and it seems that his ‘failure’ in being unable to complete his nursing training, may well prove to be a blessing both to himself and to the many readers who will find inspiration and solace in his work. Dr. Ian Williams, MB BCh MA MRCGP DA, is trainer in general practice at Wrexham Medical Institute of Postgraduate Studies. He is also the editor of graphicmedicine.org, which can be found here.